I just downloaded GuitarPro 7.5. 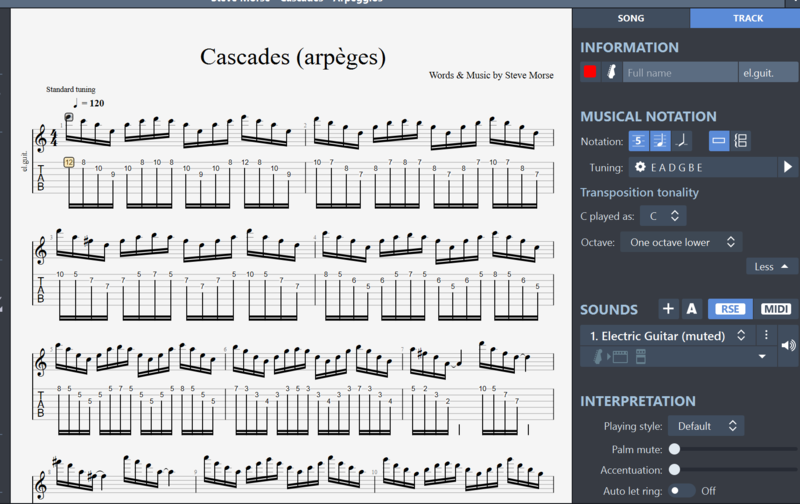 I used to use GuitarPro quite a bit, but it's been a while. I like to tune down and play in Eb. I want to change a song to sound 1/2 step lower, but want to keep the notation and tab in original finger and original key. Ie->Smoke on the Water in standard E tuning. 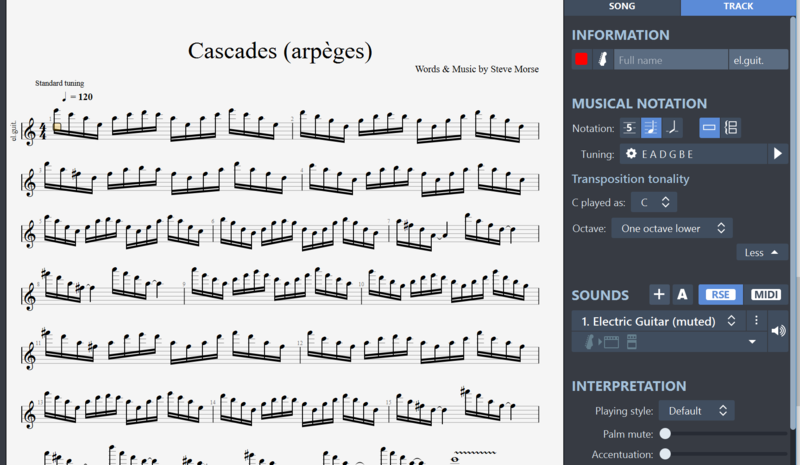 I read "real" music much better than I read tab, so I don't want to hide the score. Hope that makes sense. I used to do this all the time, but am having worst time trying to remember how I did this. -->> It's easy to do in GuitarPro 6, but not GuitarPro 7. Not sure why. Here are a couple of screencaps. First is a Steve Morse tune in A minor, w/ key in notation being C. When I change the tuning to Eb it also changes the score so that there are accidentals. I've tried transposing 1/2 step, but this doesn't work. There has to be a way to manipulate the score w/o altering the pitch/tone that is played. Hope that makes sense. I want to be able to drop tone/pitch 1/2 step, but be able to keep the notation in original key. I can't seem to manipulate the score w/o changing the actual pitch. Hope that makes sense. You simply have to change the tuning for each instrument track in the "Track Inspector". Now I don't know GuitarPro at all, so my answer is totally based on the pictures you supplied. Take the last picture where you have written how you want it to look without the tab. On the right side there are some options. Wouldn't all you need to do be to change that to: C played as B ? 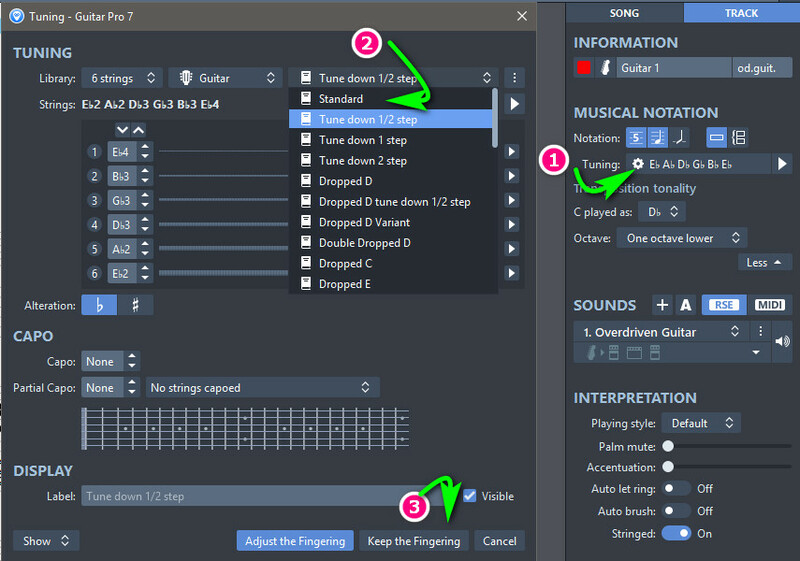 Can you load your Guitar Pro file in TuxGuitar and see if you can transpose the file there? PS I like 1/2 step down and you can switch to standard fast with CAPO 1. 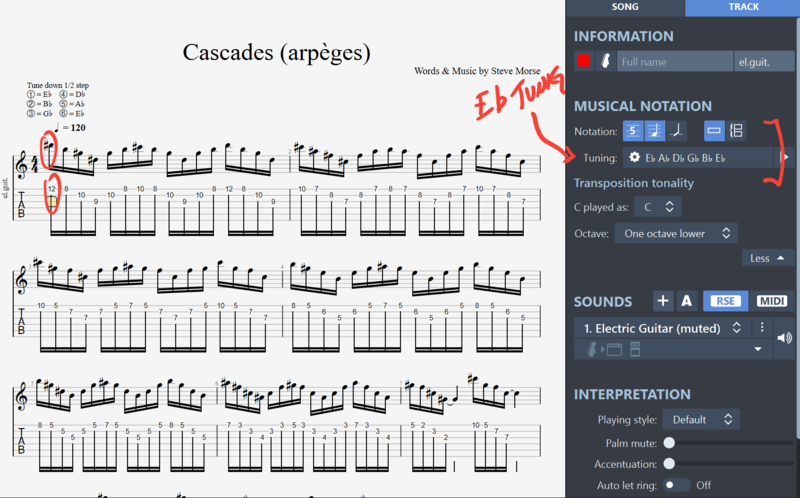 TuxGuitar also shows the scales if you like to find chords etc. I like that software. Do all the notes show up sharped when you change the key. Example are the lower and higher octaves also sharped/or flattened I noticed a lot of sheet music will not show these expect for the sharps next to the staff. Not the answer you're looking for? Browse other questions tagged tuning instruments key or ask your own question.